Given how hectic the last fortnight month has been, I'm doing another "bitsa" post (bitsa this, bitsa that) to clear some of the blog backlog and write up a few places I've visited recently and wanted to share with you, dear reader. Please excuse the longer-than-usual length! When family friends R&S were in town, we took them out to dinner at Enoteca Vino Bar (the Enoteca Sileno restaurant up near the cemetery). 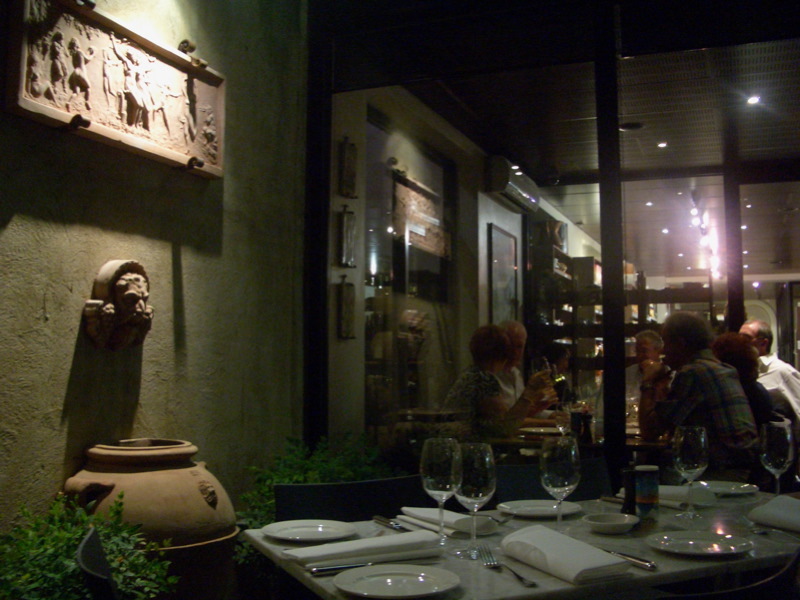 It was an unusually warm night, so we braved the sitting outside in the pretty courtyard and while we were waiting for our food to arrive we had a sticky-beak inside at all the gorgeous Italian imported produce and wines on offer. 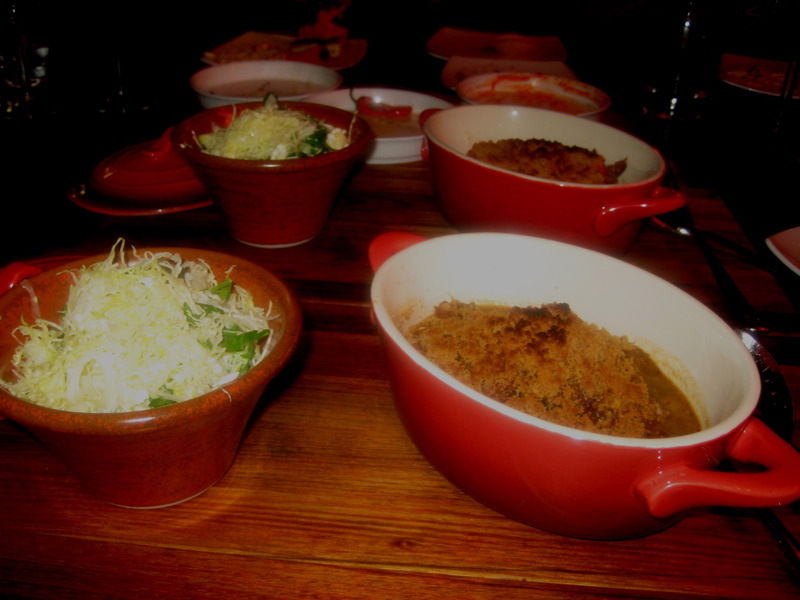 Enoteca Vino Bar does some great assaggini at very tapas-y prices. 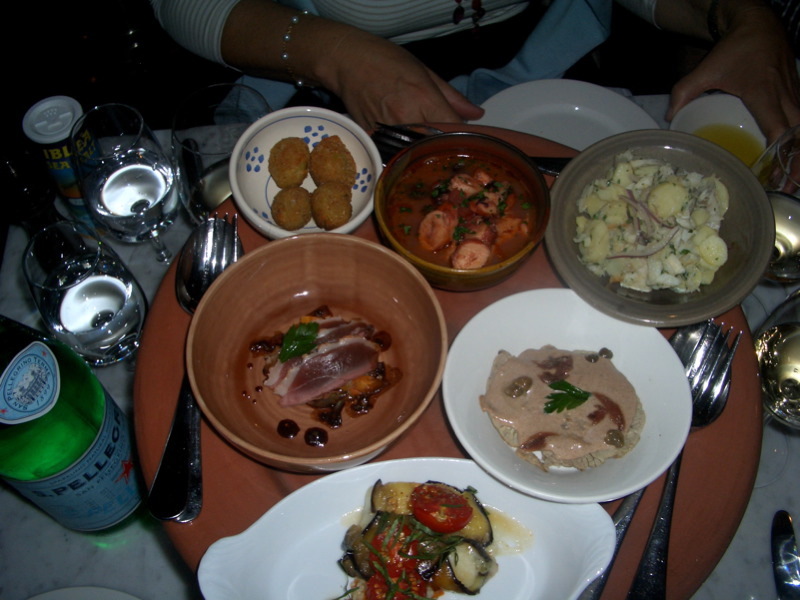 From top left and working clockwise we shared: sinful yet sensational stuffed Ascolana olives ($8.50), octopus stew with capers, olives and tomatoes ($8.50), baccalà and potato salad with onion, parsley, EVOO and lemon ($9.50), vitello tonnato ($10), eggplant and smoked mozzarella involtini ($12.50) and duck breast with carrot and celeriac salad and vincotto dressing ($11). All the assagini were delicious but the one that really stood out was the eggplant involtini - they had been roasted in the oven and filled with smoked provoletta and buffalo mozzarella, resting on a bed of fregola (a couscous-like Sardinian pasta I'd not tried before). 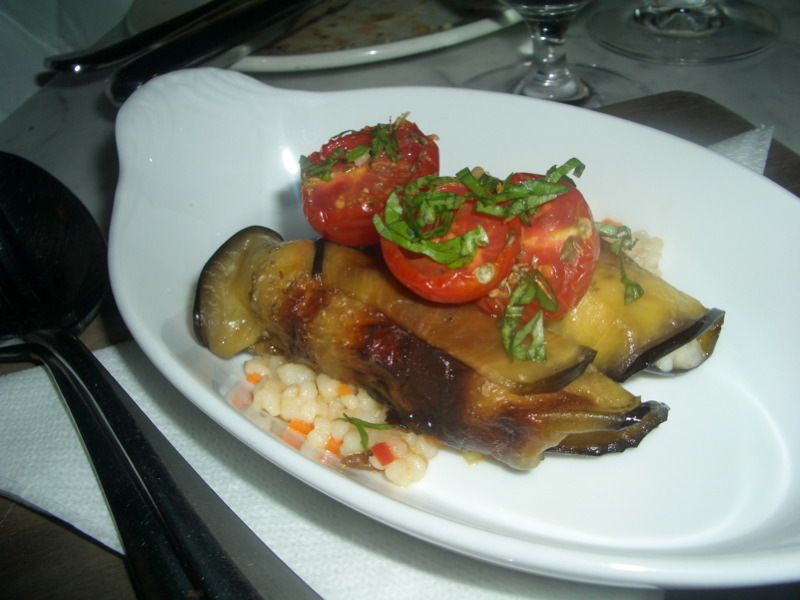 The intense smokiness of the cheese embedded in the eggplant had a real wow factor - be sure to try this if you visit! 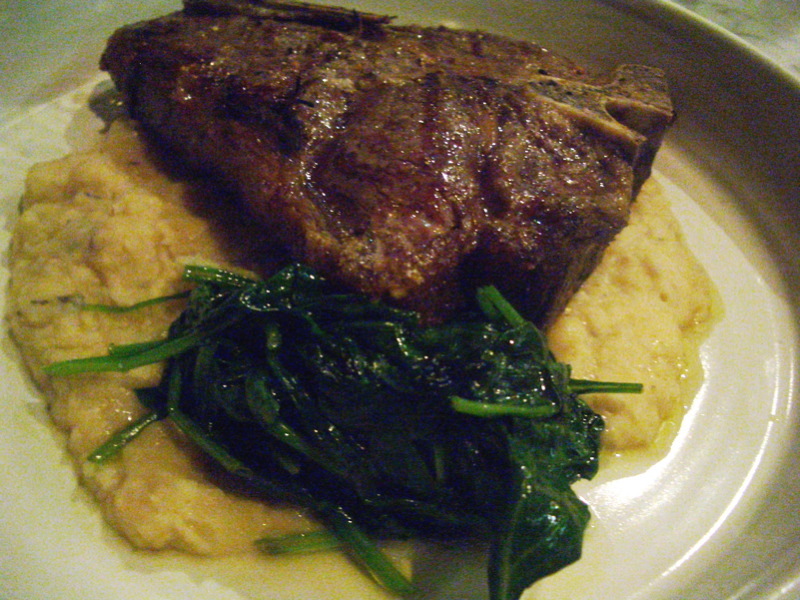 It had been far too long since I'd had one, and I felt in need of a year's supply of iron, so I ordered the bistecca alla Fiorentina: a 450g slab of Black Angus cooked to medium-rare perfection, with cannellini bean puree and wilted spinach ($42). Outrageous. 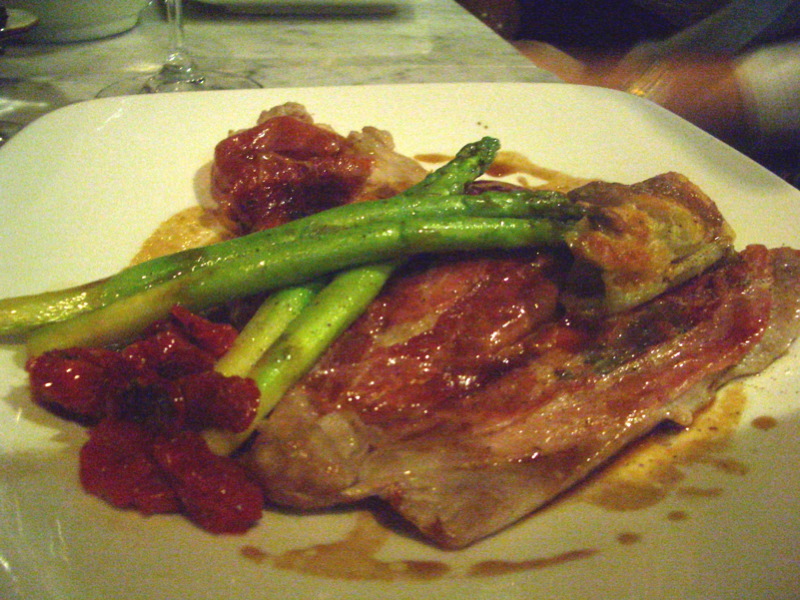 Dad went for the saltimbocca, which was rather unusually a rabbit saltimbocca ($33). 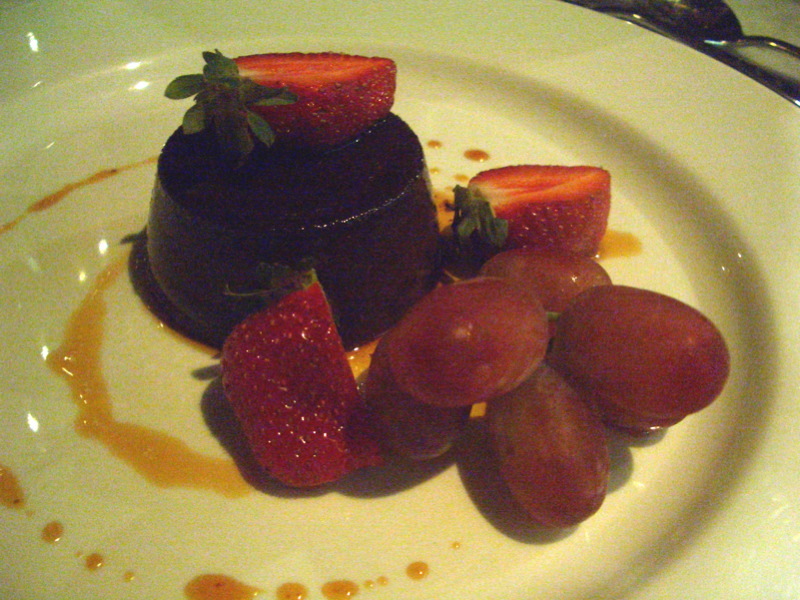 The dessert standouts were the Bonet alla Piemontese - amaretti biscuit and chocolate pudding - served with caramel sauce and fruit ($12.50) and the panettone semifreddo with candied fruit and orange vincotto ($10.50). Both tasted very authentically Italian. The food is ottimo but the mains are expensive, so I'd advise skipping them: some clever ordering of assaggini and desserts will still get you a brilliant meal for much less moolah. The food wasn't bad, but I'm not in a hurry to get back there. 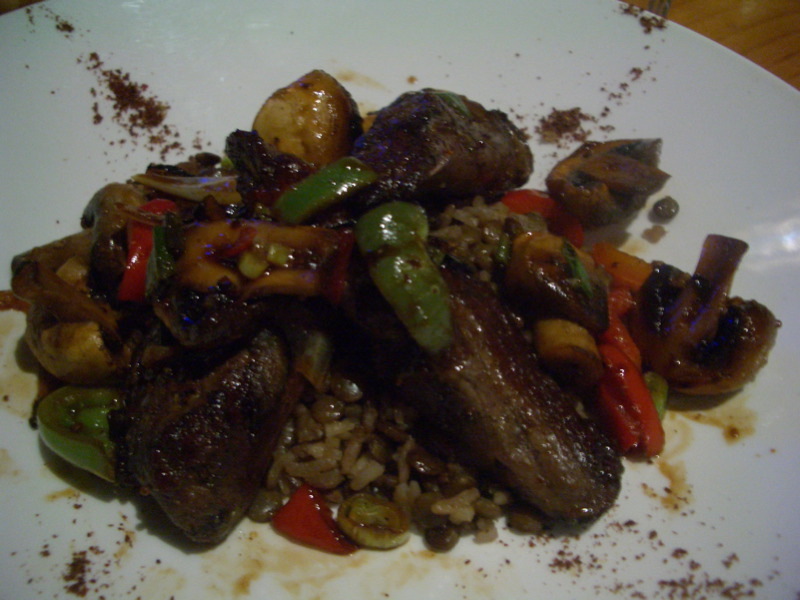 I had the Sultania ($23): lamb eye fillets sauteed in pomegranate molasses, mustard seeds and herbs. The pomegranate gave it a nice flavour but the meat and rice were on the dry side. 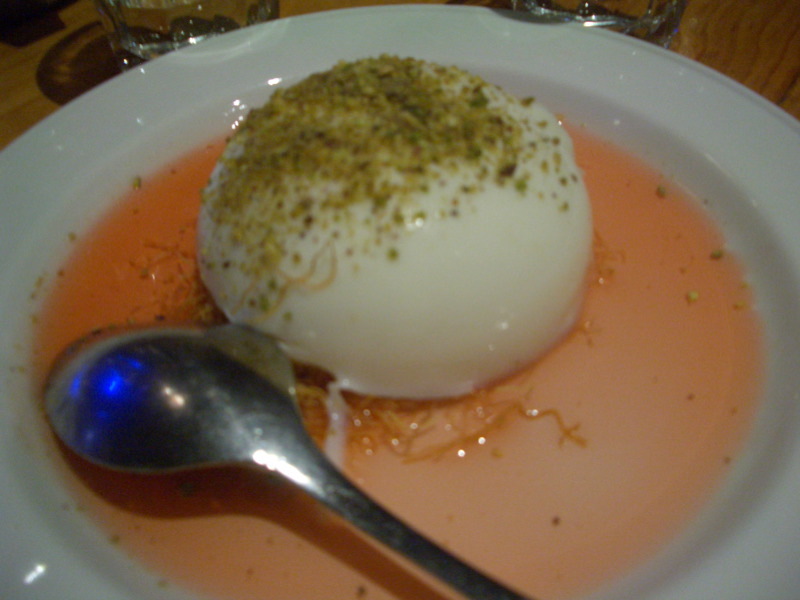 For dessert my neighbour and I shared the Mahalabia ($9): custard topped with pistachio nuts and a lemon orange blossom syrup. M, a nice young gentleman, asked me out on a dinner and theatre date the other week. He took me to Tutto Bene, which was one of the first places I wrote about when I started Melbourne Gastronome just over a year ago. 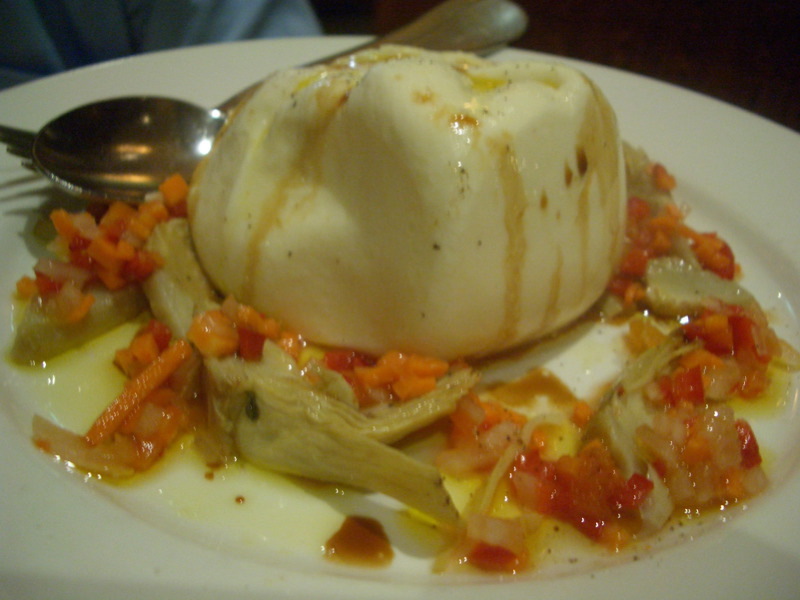 We started by sharing the Mozzarella del Giorno ($13.50) which was a Burrata, a mozzarella ball hand-filled with a soft mixture of mozzarella and cream. It was served with artichokes and a vegetable dressing, and the gooey texture and creamy flavour was utterly delightful. While M went for a risotto with sugo, I tried the Al Presidente ($20) - a unique combination of 3 year old parmigiano and balsamic vinegar, produced from a 1912 mother must, created by our chef for the Italian President visiting Australia. Like pizze, I reckon the best risotti are the simplest ones... and this is the best risotto I've had at Tutto Bene. The rice had juuuust the right amount of bite to it, and the cheese had a superior flavour. And finally, it was back to The Press Club for another Kerasma, this time with the family and R&S. More saganaki martinis, yay! Last time I'd had the Kerasma we'd also been served scallops, but they'd been embedded in loukoumades and deep fried. This time they were served topped with green apple foam (alas the foam had lost its mojo by the time I took the photo). When our lovely waiter told us what the foam was I though to myself "that sounds so damn crazy it just might work! ", but Birdie and I didn't care for it. 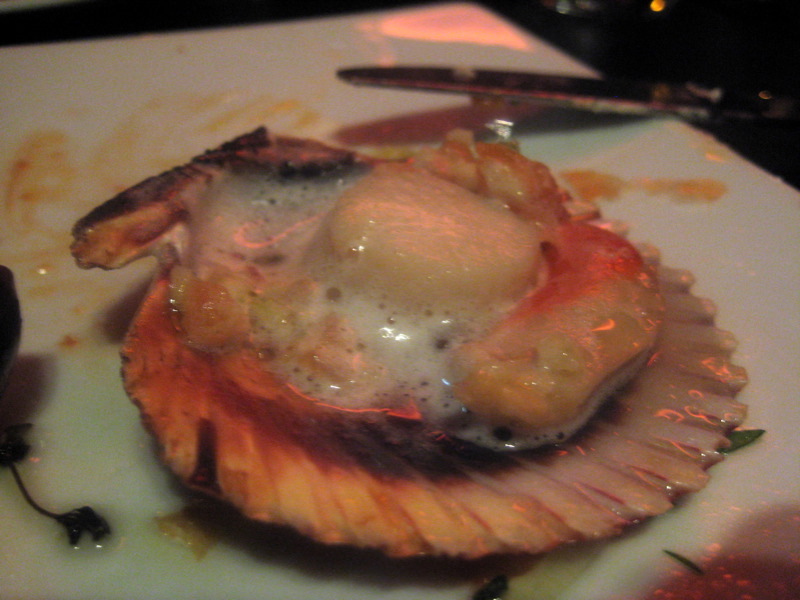 The foam gave the scallop an unpleasant synthetic, slightly medicinal taste. 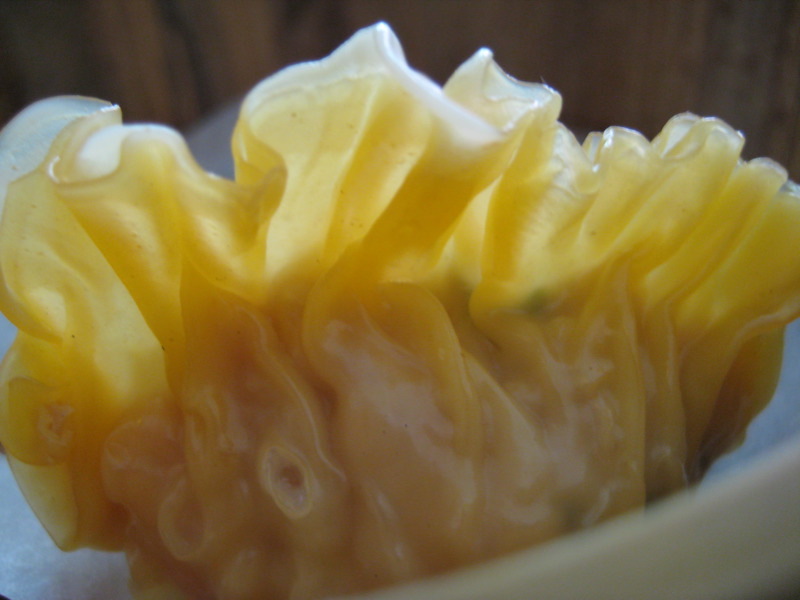 I suspect it's due to whatever foaming agent was used... soy lecithin maybe? 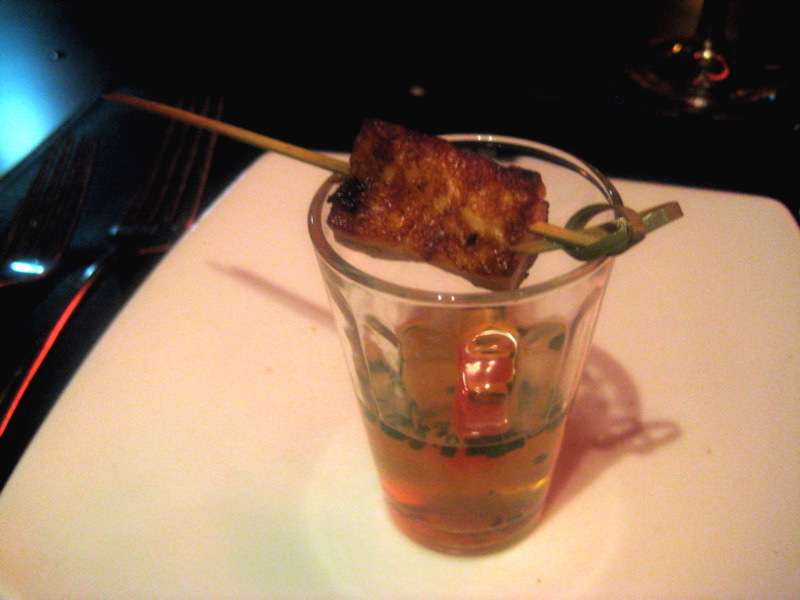 I came across the same unpleasant taste at the molecular gastronomy-berserk Chinese New Year Cocktail Night at Cafe Vue. The other items that differed significantly from the previous Kerasma were the salads. 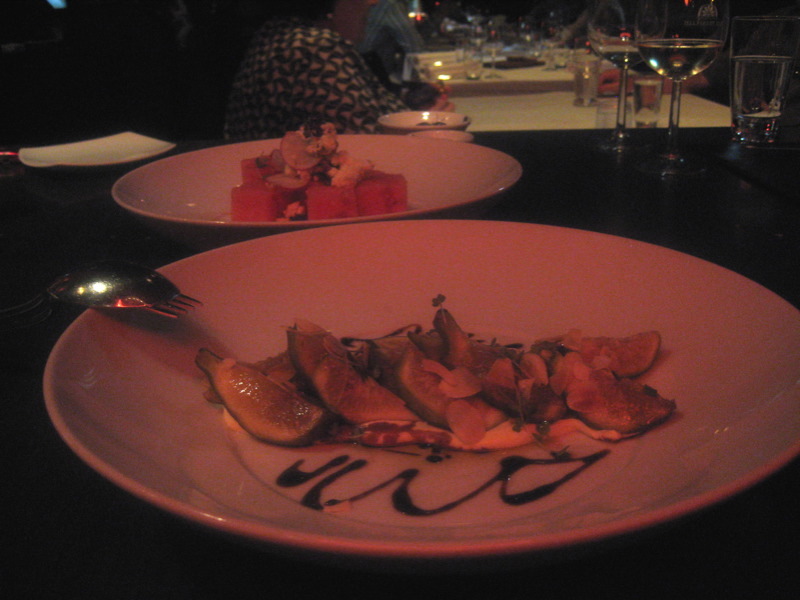 This time both of the salads were fruit-based (what with the apple foam as well, George was clearly feeling very fruity that night): one salad contained watermelon, chilled tomato egg, smoked Dodoni feta and black olive oil... the other consisted of fresh figs on a landing strip of labna, served with slivered almonds and a balsamic reduction. Both were excellent. Because Mum hates lamb, we asked for the kleftiko ("stolen") goat instead, which was served in wonderful little cherry red and white Le Creuset casserole dishes and had a melomakarona crust. Even Birdie, who'd pulled a face in squeamish teenage disgust when she'd heard we were ordering goat, agreed that the exquisitely tender meat tasted fantastic, and that the humble cabbage and feta salad on the side was very very moreish. 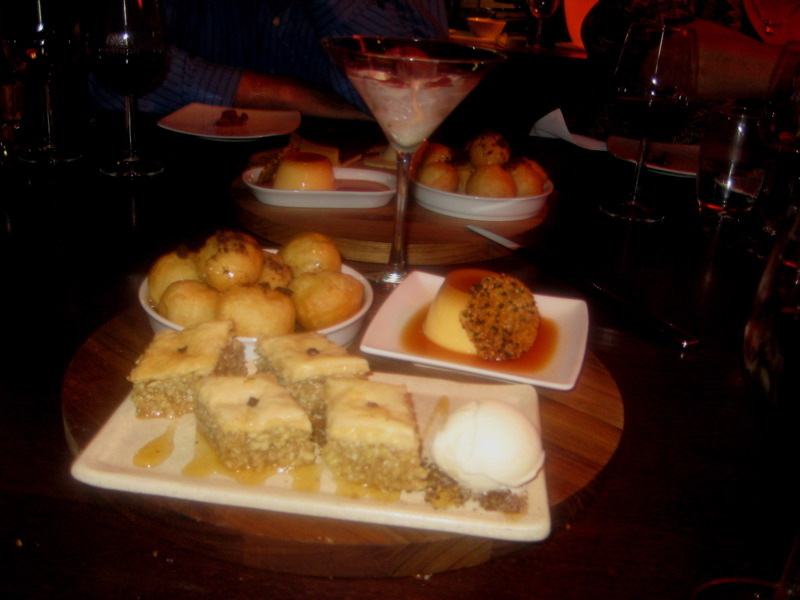 We finished with the ever-scrumptious dessert platter. R&S, our gourmand friends from the UK, were suitably impressed! they had a rotolo of mozzarella with breasola, which was quite yummy, and very different. It's cool that they put such creativity into the dish. 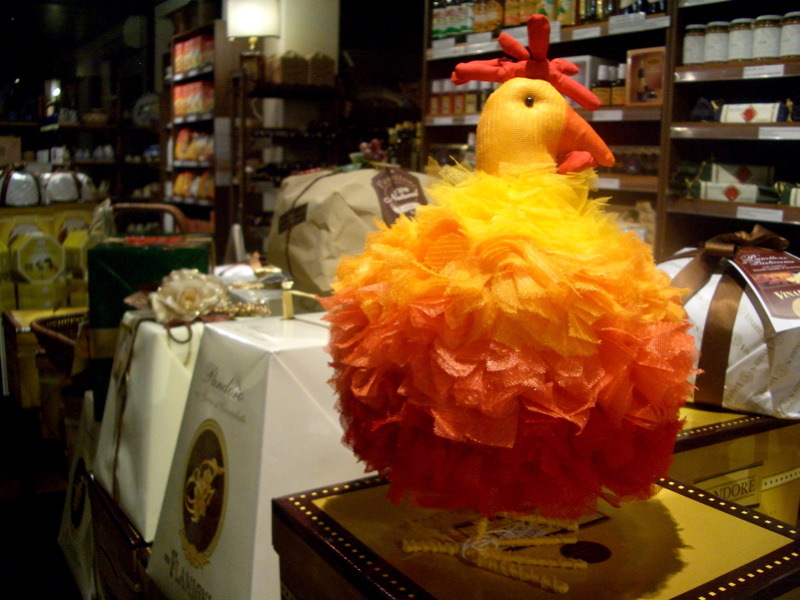 Enoteca's assagini looked great too; I'd love to try that place. 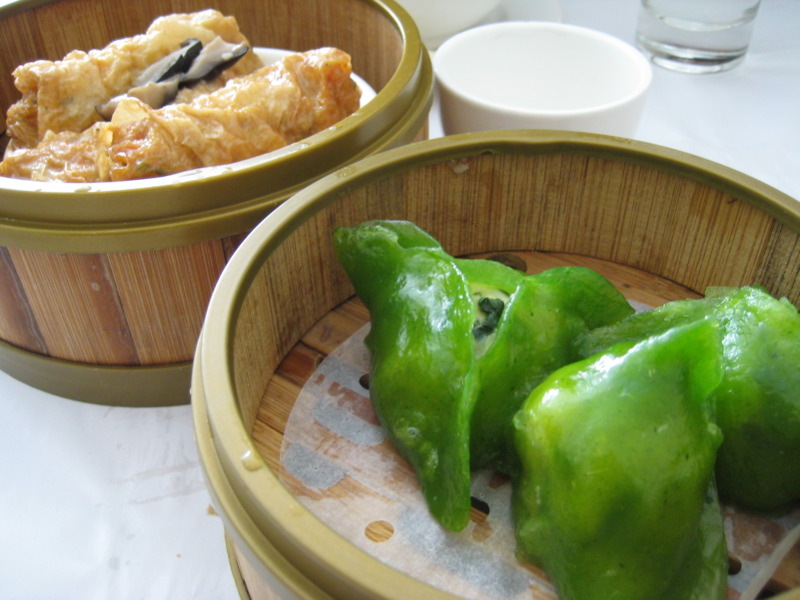 Love the lurid green dumplings and the macro shot too.. I'm personally saving for an SLR! Oh, delicious licious lissscious. 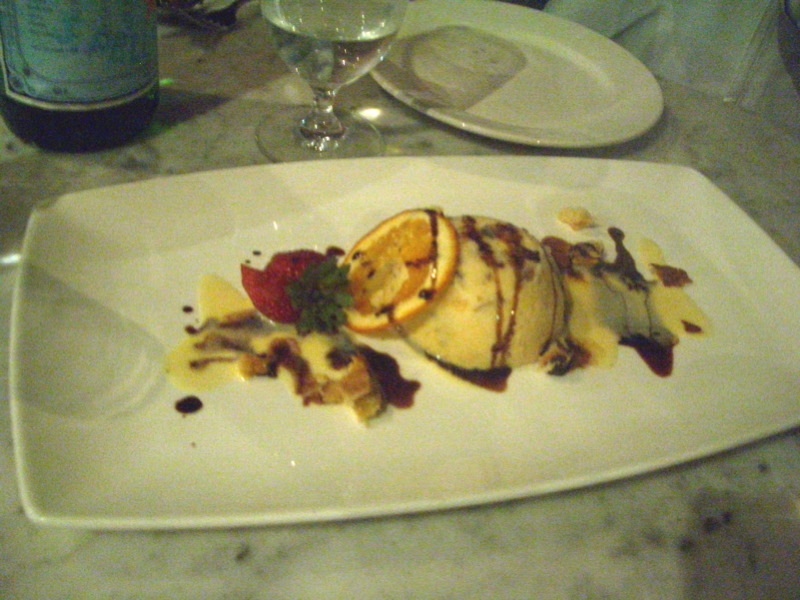 I was at Tutto Bene tonight (I know I should try some other places at Southbank but love it!) 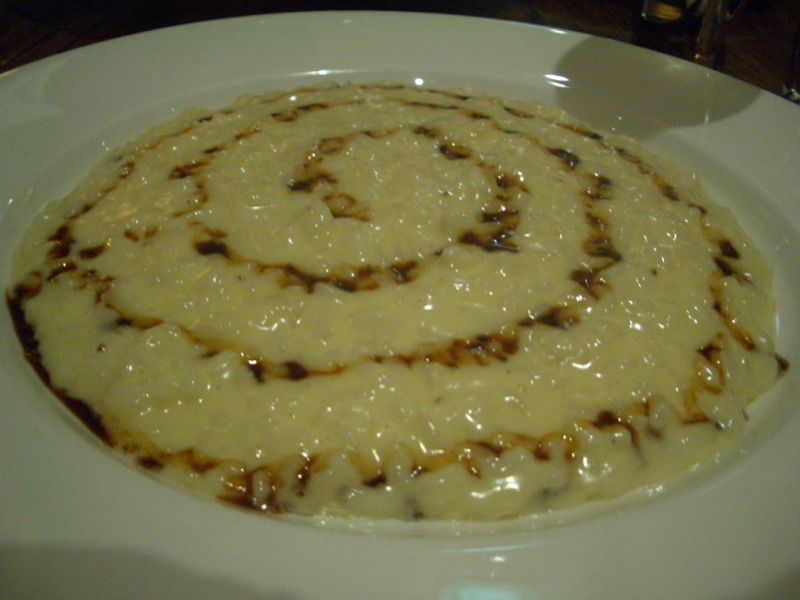 and had the risi e bisi, sigh, yum. it was bright green. alas no camera!! Probably wouldn't have taken photos anyway coz friend's parents would have thought I was weird. But so good. And I tasted Al Presidente, it was also faab. I'm incredibly jealous of your recent eats! Love your Mum's camera. Incredible photos!